Wow! This has been an amazing and memorable week for children's literature. My heart is happy for many of my favorite books and authors. I asked Kwame Alexander (The Crossover), Cece Bell (El Deafo), and Jacqueline Woodson (Brown Girl Dreaming) the same three questions. Today is Newbery Medalist Kwame Alexander's day to shine. Congratulations, Kwame! Mr. Schu: Everyone loves hearing about THE CALL. What ran through your head when the phone rang? What were you thinking about when the Newbery committee was clapping for you? Kwame Alexander: I wasn’t thinking. At all. I was dreaming. And smiling (‘Cause I had just finished the new book the night before). And I was still fuming over the worst Super Bowl call. And now, the phone’s ringing. And it says No Caller ID. And I say, this is Kwame. And it’s 7:16 am. And it’s Randall Enos. And who is that? And OH MY GOSH! OH MY GOSH! OH MY GOSH! OH MY GOSH! is what my wife is screaming in my ear, when she hears “…Newbery committee…2015…medal…” And, I can’t hear a thing except her screaming. And, I’m still not thinking, ‘cause I’m dreaming, right? And it doesn’t hit me what’s just happened until…well until never, because I still feel like I’m dreaming, because…how does a nine year old kid forced by his parents to read Roll of Thunder, Hear My Cry, a Newbery Medal novel by Mildred Taylor…become a Newbery medalist? How does one dream a whole new friggin’ world I guess is what I’m thinking? When I heard the yelling and clapping, it was as if I could see their smiles. I’ve carried those smiles in my smile since that moment. Kwame Alexander: It means that my father and mother can smile knowing that all of the grief I gave them (which they ignored) for making me read all the time was worth it. It means that all of the poets I read and the poet who taught me at Virginia Tech, Nikki Giovanni, are smiling wherever they are, because I learned how to write by reading, and learning from, them, and I’m smiling, so by transitive property…It means that The Crossover may be mentioned in a textbook alongside The Giver, Holes, and Charlotte’s Web (It’s possible! ), and that is going to, perhaps, offer a literacy lifeline to a little black boy (and as my writer friend Marcia Wells said yesterday, ‘Kwame, to any little boy’) who is trying to figure out how to find the joy of reading that he’s been told exists…It means that I can buy a new suit. What color, you ask? Blueberry. So, I guess it will be my newbery suit. Get it?! I think it means that my daughter, and your son, and all of our children will have widespread access to, and maybe even find themselves inside what many reviewers and librarians have called “an accessible literary tale.” And that just fuels my heart, in large and unimaginable ways. Reading is like visiting an amusement park. I say sometimes we gotta let the boys (and girls) choose the rides. Imagine how fun that can be for them…and us! 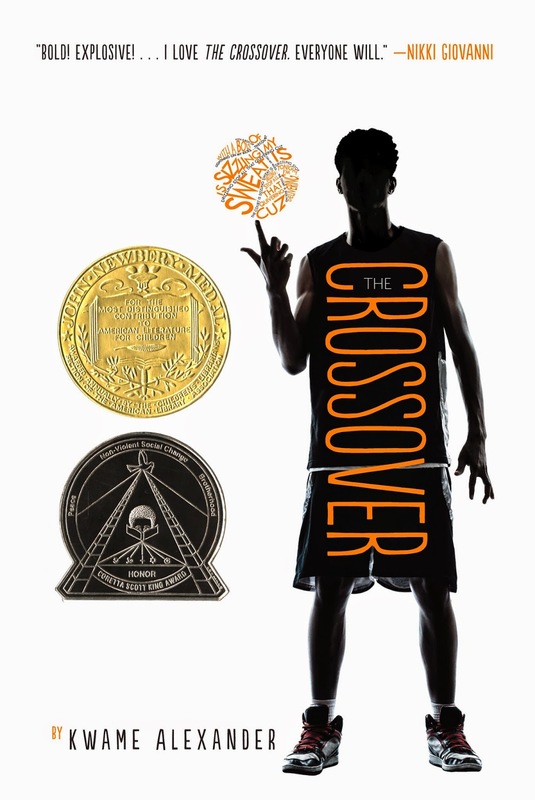 Borrow The Crossover from your school or public library. Whenever possible, please support independent bookshops. I LOVE his "Reading is" answer! Awesome!!! Reading is allowing yourself to enter someone else's world. Reading is a gateway to another world. Reading is losing yourself in someone else's world! Reading is a great way to challenge ignorance.